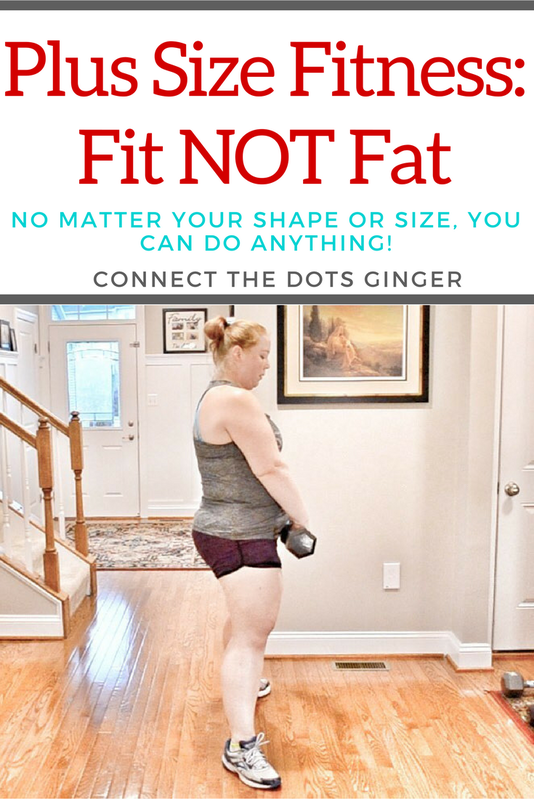 DO NOT LET YOUR SIZE OR SHAPE DETERMINE WHAT YOU CAN AND CAN NOT DO! How many times have you looked at a workout program and though, "I could never do that!"? It is easy to look at a workout program, group class or even most people at the gym and see people that are fit, lean, trim and MAKE EVERY MOVE LOOK EASY! I have thought the same thing. MANY TIMES! Actually, years ago that is what intimidated me from ever doing a live yoga class, or going to a certain part of the gym. I didn't fit the typical "look". Now, I'm all about breaking the stereotype. Because I am now doing workouts I never thought I could do. There are times I look at my video playbacks and think, "well, I just made that look easy" when in fact it wasn't, it just felt good though. If you want to do things that you don't think you can do I am here to tell you that YES YOU CAN! 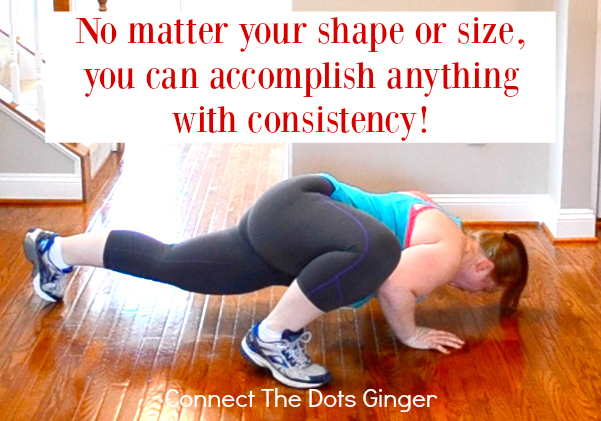 All it takes is CONSISTENCY. (I think this is my word of the year by the way because I keep using it!) 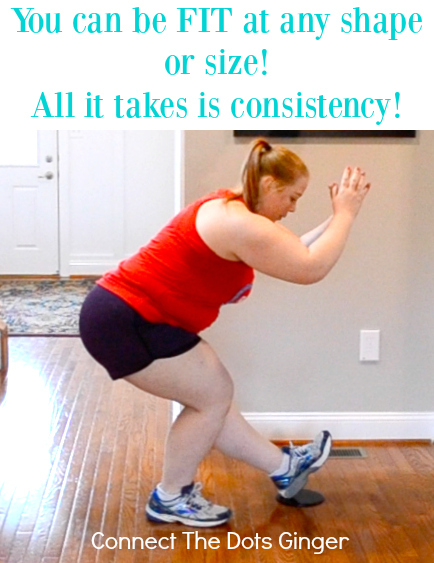 Even if you have to start with modifying every single move in a workout program, that's okay. The main thing is that YOU KEEP TRYING every single day to be better than you were the day before. 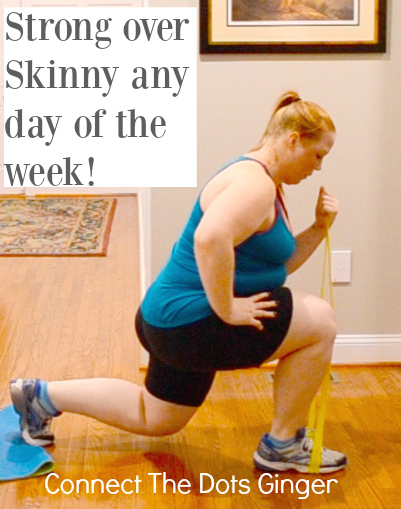 Check out this modification for Mountain Climbers. Even if you have to go from, standing against the wall, using the stairs, on all 4's then to the full out. Even doing the very first modification, you are able to rock your workout. For us plus size ladies, exercise might be more difficult because it is hard to get up and down. Or think about it physically holding ourself in a full plank position for planks or pushups we are having to hold up more weight then those "fit gals" on the workout program. One thing I keep thinking or reminding myself is how easy it is going to be when I lose the excess weight. Then I will be able to plank for days, because it will physically be easier with 50-75 pounds less weight on my frame. But to get to that point...IT TAKES TIME AND CONSISTENCY! Your key word going into any exercise is MODIFY, MODIFY, MODIFY! And only modify when you have to. If that means for every move then do it for every move. If you are able to do some moves not modified that's okay. Or as you get stronger and more comfortable with the move, start to transition to half full out, half modified until you can do them all not modified. That is progress. That is growth. THAT IS CHANGE! Are you ready to start your journey to a healthier and fitter you? START WITH GETTING YOUR YEAR MEMBERSHIP TO OVER 700 WORKOUTS AND YOUR DAILY DOSE OF SUPERFOOD NUTRITION HERE! It's the same shake and online streaming service that I use every day! When you order, I'll personally contact you within 24 hours to talk about your goals and get you started right with the right program that fits your goals and lifestyle! And I'll get you in my support groups because with support you can accomplish anything! It’s unusual to exercise with the help of trampolines, but I have continued doing so since years. It helps me to perform gymnastics much easily. Thus, I liked visiting GetTrampoline to get the best trampoline for my personal gym. Health and fitness is very important for everyone and so try to exercise every day. Yoga Classes are very important to maintain body fit. Great share!! you are truly an inspiration to many women's. Exercise boosts energy. Regular physical activity can improve your muscle strength and boost your endurance. Exercise delivers oxygen and nutrients to your tissues and helps your cardiovascular system work more efficiently. And when your heart and lung health improve, you have more energy to tackle daily chores. And after my exercises, I like to have hgh energizer for a stronger and fitter body. I would like to recommend it to every individual as it's natural and does not cause any harm to the body. It's a must try! Muscle building and achieving long lasting is extremely very difficult but you just understood that, correctly? You need to work out for two hours each day, chug down pure protein shakes and stuff orally with steak and potatoes each and every hour and get left with very slow and limited results. First read my crazybulk d bal review real experience.